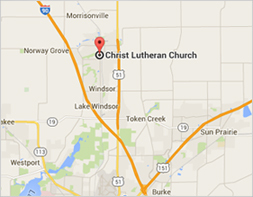 Christ Lutheran Church is committed to protecting the privacy rights of all visitors to our website. We recognize that our visitors need protection of any personally identifying information they choose to share with us. This policy is intended to provide you with information on the type of information we collect, its use and storage so that you are able to make decisions about sharing information with us. Christ Lutheran Church does not require that our website visitors reveal personally identifying information when accessing our website. Although personally identifying information may be required to participate in certain features offered through our website, users only provide their information on a voluntary basis. Christ Lutheran Church engages with the following companies to perform various church functions: SignUp.com and SignUpGenius.com to collect and distribute information pertaining to volunteer assignments; Vanco eService Payments to facilitate online financial giving; MailChimp.com to send updates and electronic newsletters; MinistryTxt.com to send text messages. These companies may require personal information to perform the associated function. These companies must use this information only for its intended use and may not use it for any other purpose. Additionally, they do not sell, transfer or otherwise disclose personal information to third parties. Christ Lutheran Church operates the website christlutherandeforest.org. However, we may create links to the websites of ministry partners, affiliates or other entities. Every effort is made to only provide links to websites that meet similar standards for maintaining privacy. We cannot control the websites and are not responsible for their content. We encourage parents and guardians to actively participate in their child’s internet use and privacy safeguarding. Parents and guardians should instruct their children never to provide their real names, ages and other specific, personal information on this or any other website without first getting permission. We will retain personal information about our users only for the period necessary to fulfill the function(s) outlined in this policy unless required by law.